Color(s): Shades of fawn, from Mahogany to Isabella. Pigmentation is required. White patches on the chest and extremities of the limbs are acceptable. The Dogue De Bordeaux a breed of dogs that is very tough,commanding and forceful with its very muscular body, have been used in different ways such as guarding flocks,to pull carts or haul heavy objects and even protect castles of European royalty and they not advised for home use, due to their twin personalities,gentle n relaxed at times and territorial and imposing nature.They however are a courageous and threatening at times.This breed is also referred to as the French Mastiff or Bordeaux dog or the Bordeaux Mastiff and is typical brachycephalic molossoid. Even though, this breed of dog enjoys good health its has a tendency towards hip dysplasia,heart problems, epilepsy and hyperkeratosis. 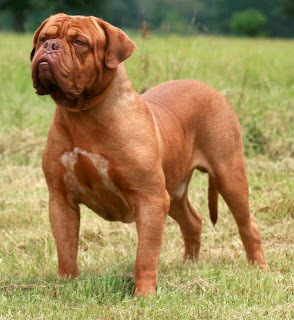 It can also fall prey to cancer,kidney disease,obesity,bloat,bone and joint problems.Neither does it take to well to heat.This particular breed of dog shouldn't be put through vigorous form of exercise, until fully mature,otherwise injury could be caused to developing bones.This dog can live between 8-10 years.The Dogue De bordeaux has a litter of 5-8 puppies, however,it can also give birth to a litter of 10-16 puppies.